Teams from Fermilab and Berkeley Lab used galaxies from wide-ranging SDSS Stripe 82, a tiny detail of which is shown here, to plot new maps of dark matter based on the largest direct measurements of cosmic shear to date. Credit: SDSS. BATAVIA, Illinois, and BERKELEY, California – Two teams of physicists at the U.S. Department of Energy’s Fermilab and Lawrence Berkeley National Laboratory (Berkeley Lab) have independently made the largest direct measurements of the invisible scaffolding of the universe, building maps of dark matter using new methods that, in turn, will remove key hurdles for understanding dark energy with ground-based telescopes. The teams’ measurements look for tiny distortions in the images of distant galaxies, called “cosmic shear,” caused by the gravitational influence of massive, invisible dark matter structures in the foreground. Accurately mapping out these dark-matter structures and their evolution over time is likely to be the most sensitive of the few tools available to physicists in their ongoing effort to understand the mysterious space-stretching effects of dark energy. 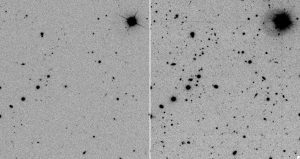 Both teams depended upon extensive databases of cosmic images collected by the Sloan Digital Sky Survey (SDSS), which were compiled in large part with the help of Berkeley Lab and Fermilab. “These results are very encouraging for future large sky surveys. The images produced lead to a picture of the galaxies in the universe that is about six times fainter, or further back in time, than is available from single images,” says Huan Lin, a Fermilab physicist and member of the SDSS and the Dark Energy Survey (DES). Melanie Simet, a member of the SDSS collaboration from the University of Chicago, will outline the new techniques for improving maps of cosmic shear and explain how these techniques can expand the reach of upcoming international sky survey experiments during a talk at 2 p.m. CST on Monday, January 9, at the American Astronomical Society (AAS) conference in Austin, Texas. In her talk she will demonstrate a unique way to analyze dark matter’s distortion of galaxies to get a better picture of the universe’s past. Eric Huff, an SDSS member from Berkeley Lab and the University of California at Berkeley, will present a poster describing the full cosmic shear measurement, including the new constraints on dark energy, from 9 a.m. to 2 p.m. CST Thursday, January 12, at the AAS conference. Several large astronomical surveys, such as the Dark Energy Survey, the Large Synoptic Survey Telescope, and the HyperSuprimeCam survey, will try to measure cosmic shear in the coming years. Weak lensing distortions are so subtle, however, that the same atmospheric effects that cause stars to twinkle at night pose a formidable challenge for cosmic shear measurements. Until now, no ground-based cosmic-shear measurement has been able to completely and provably separate weak lensing effects from the atmospheric distortions. Constrains on cosmological parameters from SDSS Stripe 82 cosmic shear at the 1- and 2-sigma level. Also shown are the constraints from WMAP. 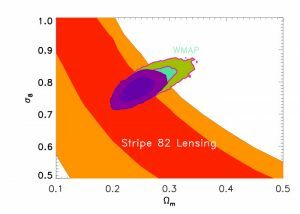 The innermost region is the combined constrain from both WMAP and Stripe 82. Credit: SDSS. To construct dark matter maps, the Berkeley Lab and Fermilab teams used images of galaxies collected between 2000 and 2009 by SDSS surveys I and II, using the 2.5-meter SLOAN telescope at Apache Point Observatory in New Mexico. The galaxies lie within a continuous ribbon of sky known as SDSS Stripe 82, lying along the celestial equator and encompassing 275 square degrees. 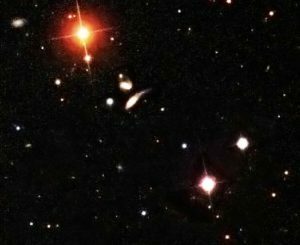 The galaxy images were captured in multiple passes over many years. The two teams layered snapshots of a given area taken at different times, a process called coaddition, to remove errors caused by the atmospheric effects and to enhance very faint signals coming from distant parts of the universe. The teams used different techniques to model and control for the atmospheric variations and to measure the lensing signal, and have performed an exhaustive series of tests to prove that these models work. Gravity tends to pull matter together into dense concentrations, but dark energy acts as a repulsive force that slows down the collapse. Thus the clumpiness of the dark matter maps provides a measurement of the amount of dark energy in the universe. Fermilab is a national laboratory supported by the Office of Science of the U.S. Department of Energy, operated under contract by Fermi Research Alliance, LLC. Visit Fermilab’s website at http://www.fnal.gov. The National Science Foundation supported this research. For more information, please visit http://www.nsf.gov/. The Sloan Digital Sky Survey is the most ambitious survey of the sky ever undertaken, involving more than 300 astronomers and engineers at 25 institutions around the world. SDSS-II, which began in 2005 and finished observations in July, 2008, is comprised of three complementary projects.